A few weeks ago, I noticed there was a pingback on one of my blog posts to what looked like a Warcraft blog judging from its title. I popped over to have a look expecting to see another WoW blogger and instead I found 3 of my own posts inserted into someone else’s blog. I was a bit confused at the start and read through the site and saw that the 15 or so posts on the blog had all had been posted on the same day. The posts they had taken from me had been set in a way to give the impression of new blog posts in chronological order. They helped themself to my about me page content (complete with my toon’s pictures), and used that as their first post, and the legion bucket list post, and very strangely and it was the one that linked back, my post on rock drakes (nothing to do with WoW lol). After my posts were a bunch of others. I read through them all wondering if they were stolen too and I might be able to recognise the blogger but I couldn’t. I typed in enough of the text from a few of the posts to find that all the other posts had come from a 2015 article on Kotaku about best memories of playing Warcraft, each of the articles on that original post were from different authors so I would believe they were all stolen posts too. My first action was to leave a comment on each of my posts asking for either recognition, or to remove the posts. My comments went immediately to moderation and I never got a response. I tried using the contact options the blog had, with again another no-response. I started googling about it and found that it’s actually quite a common occurrence to ‘content scrape’ a blog post, usually with the intent on putting it on a blog that generates money from viewers. In this case it wasn’t that; there’s no adds on the site, it’s designed to look like a genuine warcraft blog. I also found that there are legitimate WordPress addons that will content scrape for you, on the proviso you should be using them for good and credit where you got the post from. I was pretty unimpressed by this point and started looking for official complaint avenues. 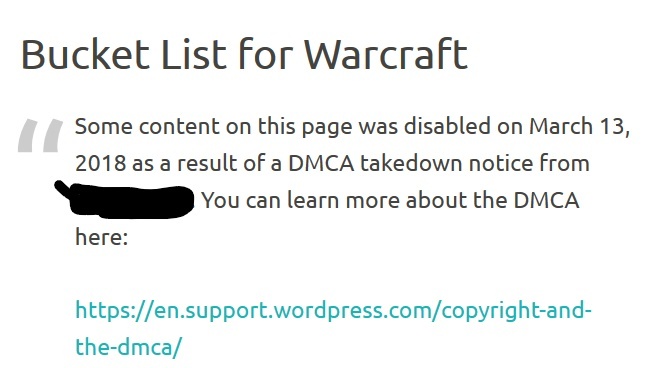 I found that you can lodge a DMCA (Digital Millenium Copyright Act) complaint and it would be investigated. It helped that this person was using an official WordPress site, as it made lodging the complaint a lot easier as WordPress have an option to do this. Here’s the kicker though, that made me hesitate for a few days before lodging the complaint – you have to disclose a lot of your personal information in the complaint form – name, address, phone number, email AND that information is then given via the full complaint form to the person you’re accusing. Great, someone has no qualms about stealing my work, and I have to hand over more of my personal details to them? However, I then noticed you can use an agent to lodge the complaint. So I ended up using a different address and phone number, though still legit in case it went further, and lodged the complaint. And a week or so later, I got an email saying my complaint was successful, though the owner of the other blog post was being given time to lodge a counter-claim but in the meantime, all my posts were taken down and this was in their place. I’m not overly impressed that my name was put onto their website but at least my content’s gone. Prior to this, I never thought much about my blog posts being subject to copyright but seeing someone steal my posts, and pass them off as their own made me realise that my work is original and if someone finds my words attractive enough to take and display, I really should be getting the credit. Given content scraping is such a common occurrence and often the author never knows, I was really lucky in the case that one of the posts that was taken had an internal link back to another of my posts which triggered the pingback. I’m going to get into the habit of trying to internally link all my future posts, as well as put a disclaimer on the bottom of the posts. This only works though in the case of content scraping via RSS feeders which keeps the post intact. If someone was determined enough to go through manually and remove your links, you might never know if a post was stolen. Have you come across stolen content before? This entry was posted in General and tagged content scraping, copyright, DCMA, stolen blog posts by Zeirah. Bookmark the permalink. That is astonishing! And a bit creepy too. Yesterday I googled “Warcraft blog” and saw that you had one of the very top links on the first page. I thought, “how does she do it?”. Content stealing happens. Luckily search engines learned to identify the original publisher, so there’s probably no use as the copying site would never be found by users. Can search engines do that? I didn’t realise they would be able to work out which was original. That’s nice to know. It’s not 100%, but in most cases this happens. To ensure that, there are search engine tools to add new articles to search engine (google them)) You just submit the new article URL, and this is it. I had that happen to me too! I didn’t think much about it though; it looked so odd. But now I know, that is what it was. So weird. I understand why you felt uncomfortable handing out all your personal info. I could have let it go, but I found it offensive that someone was blatently taking my work in the manner they did. If it had been an obvious click-bait ad filled site, I dont think I would have cared as much, but to take specific posts and arrange them in a way to mimic someone writing their own blog with my posts was just annoying. If you live in the EU, look up your country’s version of a “data protection commission” , it will be a government branch division. They can help handle these things (specially with stopping your name from being plastered on the complaint). Also, look into “Creative Commons Licenses”, another layer of extra protection. I’m in Australia, I’m not sure if we have strong data laws. I’m guessing we would but I’ve never looked into it. I’ll give the licences a google and see what they involve. I’ve never come across stolen content from myself, but I do see that someone took over Lath and Cassandri’s old Hots and Dots blog (hotsdots.com). If I knew how to contact them, I’d do so, but their contact info was removed from the people who stole the blog.